Starting very young (3 years old) to adult age, many vietnamese citizens are looking for teachers in the following languages: english at first of course, but also japanese, chinese and french languages are very popular. 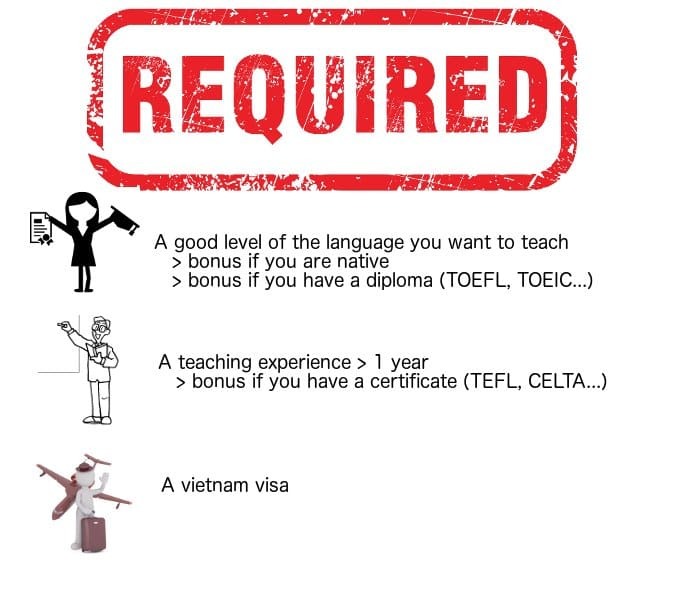 Teaching jobs are well paid (starting around 15$/375000VND an hour), and easy to find, but you need to know where to look! First, before applying for a teaching job, you need to fill some requirements. Otherwise, nobody will hire you! Your level in the language you speak is, of course, the most important part! Second part, your teaching experience. There is no big difference between those two trainees. Both train teachers to teach English language to non-native speakers during at least 100 hours, but TESOL is more dedicated to non-native speakers living in English native speaking countries (US, Canada, Ireland, South Africa, Australia, New Zealand, and US). You can easily find online courses for the TEFL which will reduce significantly the price (around 250$ depending of the website). 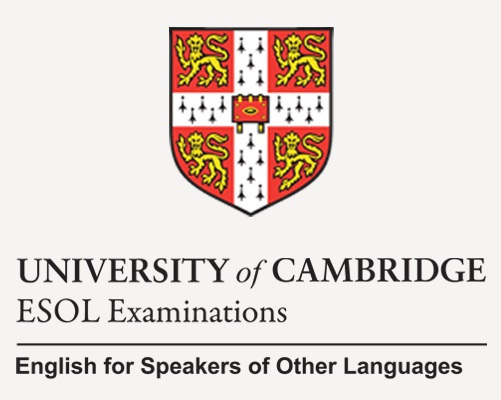 TESOL or TEFL trainees are cheaper than CELTA but don’t hold the prestige of the Cambridge certification! It is an initial teacher training for teaching English as a Second or Foreign Language (ESL and EFL). It is a suitable trainee for candidates with little or no previous english teaching experience. You can choose to learn full time, part time or online. Taking this trainee means that you have an English level equivalent to a least C1 or an IELTS score of 7.5. The price for this degree is $845 to $2,800 for CELTA depending your country and your choice between full or part time, and between $200 to $500 for online CELTA. You can find one center in Vietnam: Apollo Education & Training, International House Ho Chi Minh City (VN087)282 Le Quang Dinh st.Ward 11, Binh Thanh Dist.Ho Chi Minh City. 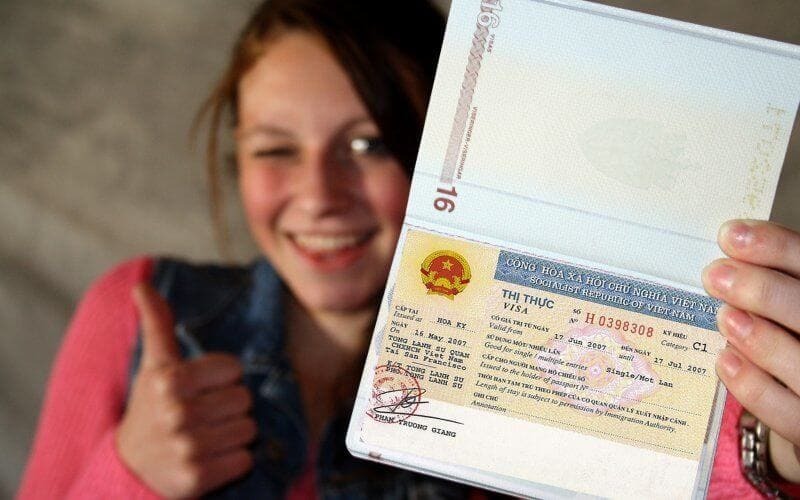 However, you can directly go to Vietnam and ask for a visa. When you will be hired, your school could refund you the fees and extend your visa if you need to. Fourth and last part, now let’s find your teaching job! For each big cities in Vietnam, you have a teaching facebook group. Just put some key words in the research section like “teaching + city where you live” and you will find it! For example, the facebook group “Ho Chi Minh City (Saigon) ESL Teaching Jobs has more than 24 000 members and “English Teaching Jobs in Vietnam” around 15 000 members. This website lists vacancy positions in many areas (teaching, management, marketing…) but also there are sections for dating, selling stuff, repairing… There are new adverts everyday published by schools, companies and individuals, but you have to sort a bit before finding the perfect ad wich will match with your needs. This website is dedicated to the expats and offers advices, but also sometimes some positions in the country you have selected. In general, Vietnamese people don’t really use linkedin but there is some teaching position offers in the section “jobs”. This website is really dedicated to Vietnam and to teaching jobs so it is one of the best to find a position. Esl cafe is used by many international teachers looking for a new opportunity abroad. There is not a section Vietnam, so you will have to sort. Another website to find a job in Vietnam, it is not only dedicated to teaching jobs. There are many schools listed on google maps that you can directly contact by email. But some schools are not on google maps, so it is better to go directly to the school to apply. You can choose to apply to : international schools, public schools or private schools. Generally, the international schools are the ones which pay the higher salary but require significant teaching experience. 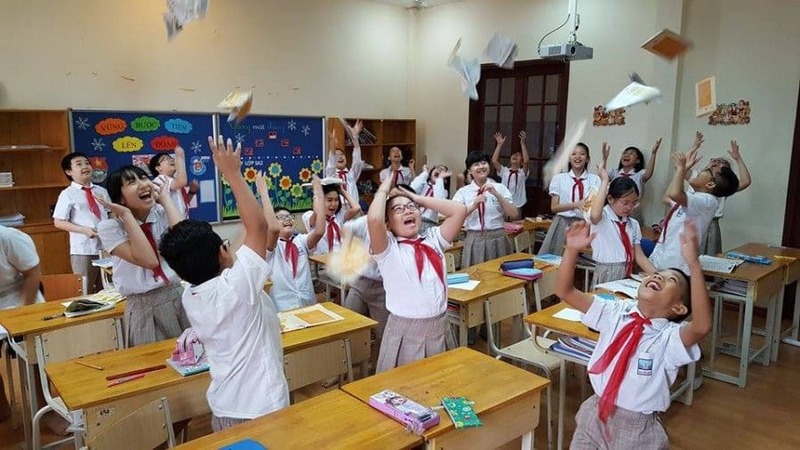 Hope this article will help you finding a teaching position in Vietnam! Leave a comment if you have any questions and don’t hesitate to share this article to your friends who are looking for a teaching job!